Originally released by Intro Records based in Los Angeles, Modern Art by Art Pepper is considered by some jazz fans as one of the best jazz albums of all time. Recorded in 1956 and 1957, this record captured Pepper at one of his creative peaks, shortly after he had served time in jail on drug charges. By that time Pepper had established his unique style and sound, and ability to tell a fascinating melodic story, full of emiotion, color and originality. Supported by a top-notch rhythm section consisting of Russ Freeman, Chuck Flores and Ben Tucker, Pepper's performance on this album is truly inspired. In the compelling "Blues In" and "Blues Out", he bares his soul through musical expression and shows us what is possible in the simple blues form and accompanied only by Tucker's bass. Pressed in the U.S. with vintage pressing machines in an attempt to replicate the sound of the 1950s, the sound of this Japanese reissue vinyl is fantasitic - very natural and authentic. 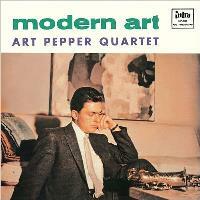 Highly recommended for vinyl aficionados, collectors and fans of Art Pepper! Recorded on December 28, 1956 at Radio Recorders and January 14, 1957 at Master Recorders, Los Angeles. Mono. Originally released as ILP-606 by Intro Records. This limited 200-gram vinyl reissue released by EMI Music Japan in 2013.